For three years in a row the Cardinals have returned to this place to build their nest. From my kitchen window I watch as they painstakingly weave bits of twigs and string into a safe bed for little ones. When the work is completed, she lays her eggs, and then comes the long wait. Day after day I watch as she patiently sits, keeping her unborn babies warm and protected. 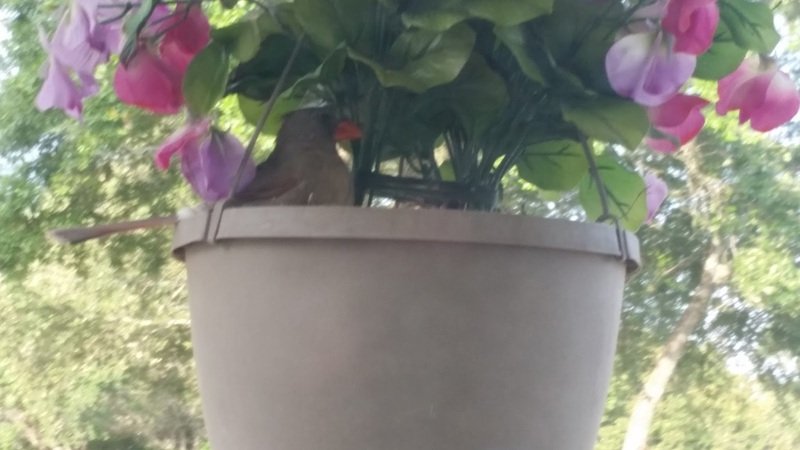 The nest is tucked deep inside a hanging planter on our porch. I think it a wise choice until I see how it is buffeted by the wind. Some days I wonder how she remains so steadfast as the planter swings wildly back and forth. She leaves only for brief periods - to eat and take care of necessary things I suppose. Please come visit Laced With Grace. I'll be there with the rest of this little devotional.